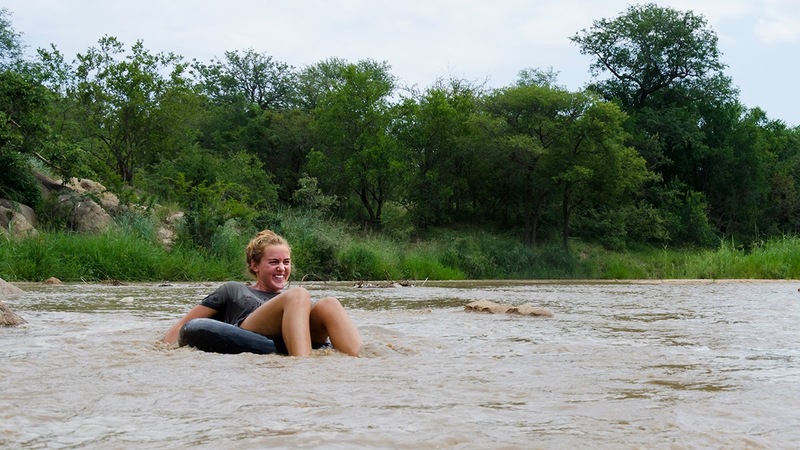 Karongwe camp is nestled on the banks of the seasonal Karongwe River. 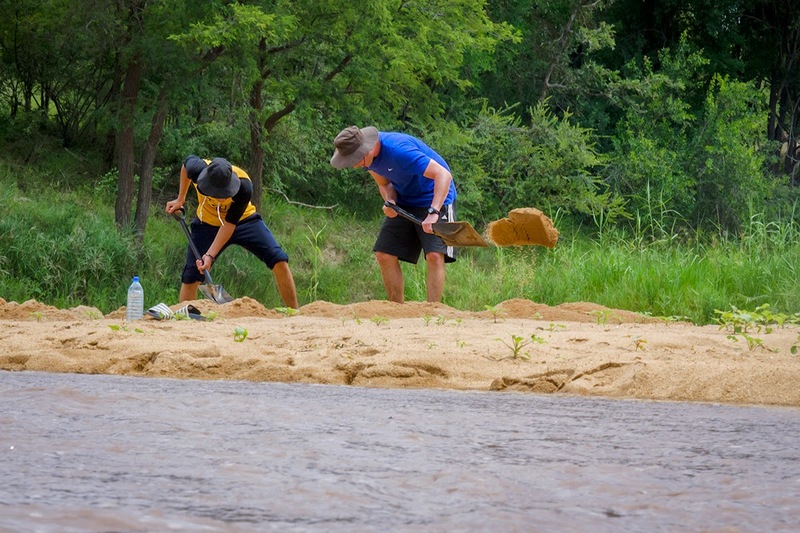 Usually the river bed is a channel of soft sand that acts both as an animal highway and a venue for our fabled volleyball exploits. But February is a month of rain, and Mother Nature cares not for our sporting prowess… Yesterday morning the cloud cover was thick but very little rain was forthcoming. To the west however, the deep rumble of thunder was our constant companion as the towering slopes of the Drakensburg received a wet start to the day. At about 2pm, the run off from the assault finally reached the river bed and within 5 minutes, our sandy playground was transformed into a water wonderland nearly a meter deep. 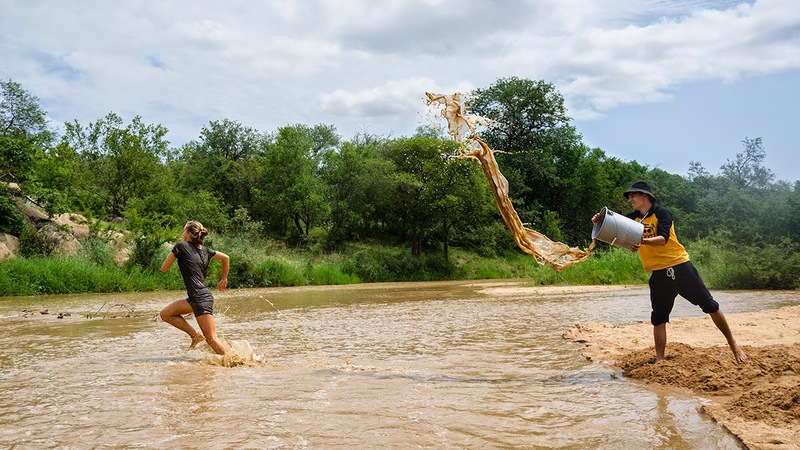 The oppressive humidity of the last few days had all of us scrambling to the river to enjoy the refreshing elixir generously provided by the heavens and it was all hands to the deck as some of the students rushed to find shovels to try to dig a make-shift swimming pool! Never was a more losing battle fought…. The relentless torrent soon overcame the defences and within 15 minutes, the hole was enveloped and the students decided to instead frolic in the cooling waters. One has to think creatively in such basic surroundings and it soon occurred to one of the students that we had an old inner tube of a tire in the garage. In a world dominated by Xbox and Playstation it is amazing how much delight can be gleaned from such a mundane piece of equipment! For the next hour or so, students took turns riding the torrent (well, gentle flow is perhaps more accurate but artistic license is a wonderful thing J) and relishing in the cool waters! It was a nice way for them to let off steam after 3 intensive weeks of information, practicals and tests and they all made the most of the opportunity. Today the river has all but dried up, the delights of yesterday’s watery wonderland a mere memory. Karongwe’s oasis has vanished once more but with humidity still high I’m sure it’s only a matter of time before it is rekindled. One of the major factors influencing South Africa’s weather is the Great Escarpment. Warm moist air from the Agulhas current rises over its face, condensing to form great bands of cloud that distribute across the country. The mountains are the engine that drives the weather patterns of the Lowveld and the interior. With Karongwe nestled at the base of them, more rain is expected and it will be welcomed with glee by every organism that resides within it, ourselves included.